Part 2: What’s Cool About Review + Approval? Part Two: What’s Cool About Review + Approval? 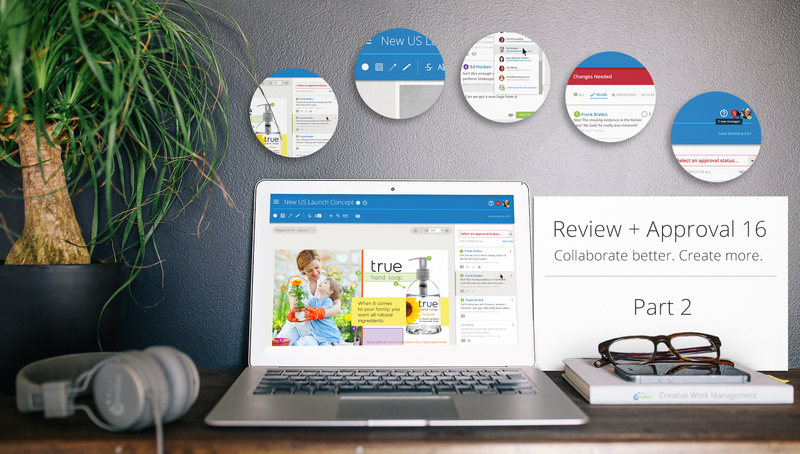 Review + Approval is stocked with brand new functionalities designed to make collaboration easier than ever. Our Customer Success team explored the ins and outs of what makes it awesome with the inMotioneers who built it. The second installment of their Q&As explores how Review + Approval lets users collaborate in real-time. Check it out! What was some of the thinking behind the real-time collaboration functionality? We know that once you get to later in the creative production process, reviewers who need to approve work are often outside of the creative team. Earlier in the process, it’s usually someone from the creative team. With Review + Approval, we’re trying to address those two scenarios: a) the collaboration between 2 groups and b) designers or creative team members reviewing each other’s work. Another thing we thought about is that when designers go to design school, they regularly have to go up in front of everyone and show them their work, and they critique it. And that has translated over now to how creatives work. Often, teams will pull all the designers into a room or on a conference call critique their work for a bit, and the designer will go back and refine before submitting to the project manager and client for review. Review + Approval’s real-time collaboration allows for this “portfolio review-esque experience.” So we’re adapting to how creatives actually work now. What does “real time collaboration” mean? How does the functionality work? We wanted to make real-time collaboration a part of the new review environment to give users the experience of working on something together, right now. There’s no limit to how many people can be working on an asset together at a specific time, and you don’t need to hit the refresh button. Now people can come in, deliver annotations and suggestions, and other reviewers can see them immediately. If you @ mention someone, they will immediately get a notification in the top right corner that says “John Smith” or whomever has liked or replied to your comment, Facebook-style. We also changed the permission around users in the system. If you give someone permission, or take it away, that happens in real-time, too. Additionally, with invitations in the old system, the invite didn’t occur until you saved, exited and submitted your review. Now, when you send out an invitation, the recipient gets notified immediately. What does 20% more review space on the review canvas mean for users? One thing we often heard from users is that the old review space got cluttered pretty quickly. The more comments people made, the more crowded the space became, because the comments would be directly on the asset. It’s a common issue with online proofing tools, but it limits users from being able to give the asset they’re reviewing a fair shake. The new collaboration panel frees up the review canvas so users always have a good view of the asset they’re reviewing. Comments are pushed to the side so people can clearly see the asset and leave others’ opinions on the sidebar. Another big contributor to the 20% more review space is the way we handle annotations on the asset. In the new review environment, when you go into an asset and you want to focus on a conversation, the asset clears itself of annotations. So reviewers can get in to a pattern of: Focus completely on the asset, make their review, jump to the other conversation, and focus on that. How do you invite people to review? Inside the review environment, you can invite people by typing in their email address, creating a short message and hitting send. Then they get invited. An additional way is to generate a shareable link and send it to them via instant message, email, whatever. You could even tweet it and let the masses review your creative work if you wanted to! What happens if you @ mention someone who isn’t in the review? If you’re making a comment, and you want to mention someone that’s not in the review, you can @ mention their email address, and they would receive an email notification letting them know a user called their attention to something in a proof with a link to go check it out. Once they accept the invite, they would show up in the list of people that are able to be mentioned with an @ symbol, and could then see and potentially collaborate with everyone else already listed in the review. What are the benefits of being able to emphasize comments in the review environment? Instead of making negative actions possible, like disregarding comments, we wanted to encourage positive actions like being able to make comments as “to-do” in connection with each creative asset. For example, in the new review environment, someone could make a comment like, “make the font green.” Then, someone else could comment, “make the font blue.” Then someone else could comment, “why do you guys want to do that?” Review + Approval allows all three of those users to then start a conversation in the actual review environment, and decide what to do about the font. Another benefit is that it helps users make important feedback stand out. For example, instead of going through and disregarding every comment in a conversation stream, a feedback manager can come in, move all the irrelevant feedback out of the way, and emphasize exactly what direction they want a designer to take. That also saves the designer from sifting through tons of irrelevant feedback and possibly missing the relevant direction. And again, we designed the comments to be positive actions. Whereas disregarding a comment might potentially offend someone, if you mark some items as to-dos over others, you’re now contributing to the conversation and offering clear feedback that doesn’t necessarily say one opinion or instruction is more than important than another. To learn more about the functionalities in our new online proofing environment, check out post 1!